I'm counting down the Top 100 of 1972 on Saturday's and Sunday's "The Rest Of The Week With Rich Appel," Saturday from 6 am -1 pm ET and Sunday from 10 am - 3 pm ET. Ranking is based on weekly surveys dated 1/1 - 12/31/72 from stations in all major U.S. markets, courtesy of survey statistician Tom Smith. Thanks! Glad you made the change of plans. We're enjoying the random stuff through the holiday weekend. I think you should print this as a public service announcement for your wealthy readers. I wanted to take a moment to let you know the latest about our films "Wages of Spin" and "Charlie Gracie: Fabulous". There have been over 500 combined PBS affiliate screenings and both films have been added to The Rock and Roll Hall of Fame Archives. By the way, we should be done with the "Wages Of Spin" sequel in 2013. We will performing a 69th B'day Celebration at BB Kings club in NYC on February 7th and 8th 2013. Tix are already on sale and going quickly so enough said. I just wanted to weigh in your recent radio ranting. While I am in agreement that commercial radio’s refusal to play a variety of the great oldies we all love and hold dear, is incredibly frustrating, I will play devil’s advocate and try to see the glass as half full. Fighting this trend is just futile. The average listener just has no interest in any music that preceded their adolescence. Many of those in our general age group (we’ll call us “aging baby boomers”) just prefer to hear the repetitive, overplayed, small selection of tunes played on the air ad infinitum. (No need to name those songs. We all know them – the usual suspects haven’t changed for years and years.) Of course, a Forgotten Hits subscriber is not an “average listener” and we want more. So why am I so optimistic? We have so many options other than commercial radio today. You can bring up almost any song you can think of on YouTube almost instantaneously. You can purchase virtually any song on I-Tunes from the privacy of your own home. I subscribe to Sirius Radio XM and there are several great stations to choose from, including 50’s on 5 (outstanding), Siriusly Sinatra, Little Steven’s Underground Garage, Elvis Radio, Willie’s Roadhouse and Soultown. There are forums like Forgotten Hits at our fingertips where we can talk to our fellow fanatics from anywhere in the world and hear and read about our fave artists and songs 24/7. Finally, if you’re a completist and want great sounding copies of these songs from back in the day, you can pick up a catalog or check the website of a company like Collector’s Choice Music and order great CD box sets which sound better than they ever have (no ER or scratchy mono like the old days) and usually include booklets with loads of information and photos. The songs are generally in stereo (sometimes glorious mono) and are lovingly remastered by people who love the music the way we do. I say - forget commercial rock radio (I did years ago) and embrace all the options we have today to enjoy the many nearly forgotten artists and songs we still cherish. On March 5th, a collection of 12 previously unreleased recordings by Jimi Hendrix will see the light. 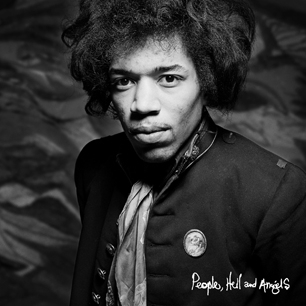 People, Hell and Angels follows Hendrix in 1968 and 1969 as he works on material apart from the Jimi Hendrix Experience and suggests new, experimental directions. The legendary guitarist was considering these new sounds for First Rays of the New Rising Sun, the planned double-album follow-up to Electric Ladyland. Hendrix toys with horns, keyboards, percussion and a second guitar, exploring fresh diversions from his legendary guitarwork. The album artwork is simple, yet as distinct as Hendrix's signature guitar wails. Be experienced yet again. More on Burton Cummings in this link sent in by FH Reader Tom Cuddy ... similar to the one we ran a week or two ago, it sounds like a healthier and happier Burton has no plans for retirement anytime soon. 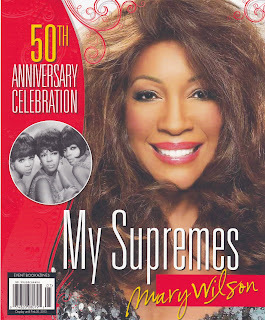 December 8 will see the official release of the full-color magazine “50th ANNIVERSARY CELEBRATION / MY SUPREMES / MARY WILSON” (Event Bookazines / Hudson News). 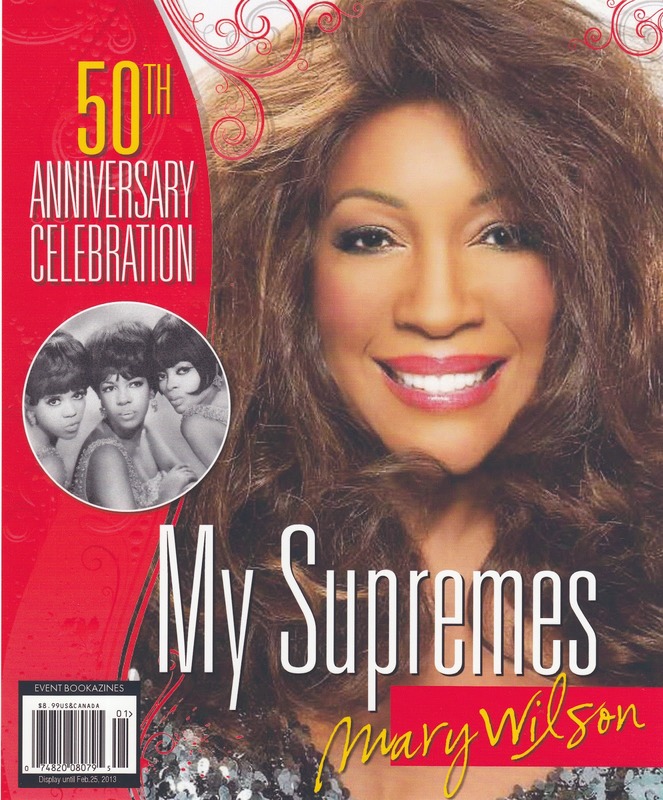 The 128-page publication, edited by best-selling author Mark Bego, is a lavish and exciting remembrance of the top-selling female singing group of all time: The Supremes. The magazine will be available at Barnes & Nobel, Target, Walmart, Hudson News shops and wherever magazines are sold. The Supremes were an American female singing group and the premiere act of Berry Gordy’s Motown Records during the entire decade of the 1960s. Originally founded as The Primettes in Detroit, Michigan in 1959, The Supremes’ repertoire included pop, soul, rock & roll, Broadway show tunes, psychedelic soul, and disco. They were the most commercially successful of Motown’s acts and are, and to date they are America’s most successful vocal group with 12 Number One singles on the “Billboard” Hot 100. Most of these hits were written and produced by Motown’s main songwriting and production team, Holland–Dozier–Holland. At their peak in the mid-1960s, the Supremes rivaled The Beatles in worldwide popularity. Mary Wilson’s career has continued to prosper with a series of well received solo albums, the most recent being “Life’s Been Good To Me” which is due to be released in early 2013. She also wrote the New York Times best-selling memoir: “Dreamgirl: My Life as a Supreme” in 1986. Watching the AMA awards the other night, I've just got to throw down. Taylor Swift is the bomb dot com. I can't get over the whole package, commercial songs, stage routines, and to top it all off, she's super fine. Will she ever slow down? I know I'm an old joker but she does have the goods. Also I never thought I'd say this, but I have to give Beiber his kudos ... he is pretty good ... goofy but good. It seems like he's on some kind of accelerant but I know it's just youthful energy. There were others as well, but Taylor set it off. Good to see clean kids doing their thing with credibility. Those megalopolis names were floating around in my head for a loooooong time, and NOW I know where they came from! EVERY school in our area used Weekly Readers! Weekly Reader has actually been replaced in most schools by Time For Kids ... yep, a subsidiary of Time Mag. BUT the kids will certainly relate to this, as the Time For Kids is not only written for kids, but by kids. Just a title change for the elementary school child. Hope this finds you, Frannie and your families well!! I can't believe it's been this long. I remember the Oldies and Freakin Oldies chat rooms and miss the camaraderie and love of oldies we all shared. Here in Greensboro, NC, we haven't had an Oldies station for years. I just listen to my albums, cd's, cassettes, and youtube to hear the oldies. At least I have passed my love of music onto all six of my kids and so far my oldest grandson. May you all have a wonderful Holiday!! You formed the group and picked the players. Would you say Led Zeppelin was your band? There was no doubt about that. At that time, absolutely. I’m the one presenting the material and giving the ideas, how these things should be done. But the ruthless efficiency – everybody went into the first album with that. Everybody knew how good we were. And we were strict in that if we were writing something and it sounded like something else we’d done, we’d immediately drop it. There was one tipping of the hat: “Tea for One,” which was like “Since I’ve Been Loving You” [onLed Zeppelin III]. That was intentional, to apply a different feel to that blues. Were you hurt by the initial, negative critical reaction? 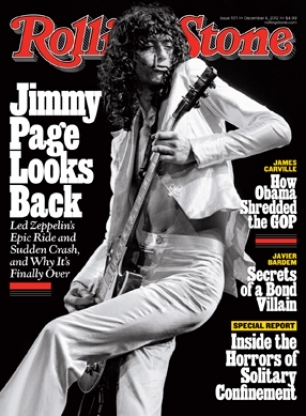 I was hoping you would ask that, writing for Rolling Stone [laughs]. There was a certain amount of acid poured on us. I could see it as venomous then. How I see it now? It went over their heads. I will give the reviewers the benefit of the doubt – each album was so different to the others. After Led Zeppelin and Led Zeppelin II, you get III: “What’s this about? Acoustic guitars?” There were crazy con clusions: “They’re doing a Crosby, Stills and Nash.” That’s because your ears weren’t open to the first album, when there was quite a bit of acoustic guitar too. Did the reviews make you mad? It made me more determined. I knew what we had. We obliterated them in San Francisco on the first tour. [Led Zeppelin opened for Country Joe and the Fish at the Fillmore West for three nights in January 1969]. By the time we were moving on, through these other territories, everybody wanted to see what had come from the ashes of the Yardbirds. I'm really glad someone noticed there are two versions of ALVIN'S HARMONICA, with different harmonica "riffs." This is partly speculation, but Liberty Records may have gotten into stereo later than some other labels. I understand that Martin Denny's EXOTICA was actually recorded twice; Denny and his group brought back into the studio to re-do the whole album in stereo, to satisfy dealer demands for a stereo version that didn't exist as the original had been recorded in monaural only. David Seville / Ross Bagdasarian, Sr. recorded the Chipmunks on multiple 35mm magnetic film masters, one each for Alvin, Simon, Theodore, "Dave" and the instrumental backing. Being sprocketed and edge numbered allowed for easy and sure mixing, using a multi-roll "gang" synchronizer common in film editing. Several years ago, all the component parts of "The Chipmunk Song" were found in usable condition in Capitol's warehouses, and allowed the classic Xmas novelty to be mixed in true stereo for the first time. Anyway, it's likely the stereo mix of ALVIN'S HARMONICA was made a couple years after the original mono single mix, and the track carrying the harmonica riffs was lost or destroyed and had to be re-made. The alternate version first appeared on the stereo LP LET'S ALL SING WITH THE CHIPMUNKS. Some later pop singles I can think of that differ from the LP versions include Tony Orlando & Dawn's CANDIDA (additional brass on the LP) and STEPPIN' OUT, I'M GONNA BOOGIE TONIGHT (added chorus and strings on 45,) Cher's GYPSIES, TRAMPS & THIEVES (gypsy guitar audible on stereo LP. mixed out on mono 45) and the Carpenters' TOP OF THE WORLD (two completely different takes, and the "wrong" one re-issued on the oldies 45.) Collectibles Records and Columbia re-mastered Doris Day's EVERYBODY LOVES A LOVER in stereo, but forgot to over-dub the two tracks so she's no longer "singing with herself" at the end! I KNOW you, and know the picture will spur your interest since we were both raised on WLS and WCFL. It is from a cool website called 45cat and has about 700,000 45s listed, most with pictures and comments. This is only ONE of my contributions. It is easy to do! You simply check out the listings. Add 45s that are not listed. Add images to those without images. Add your collection to the data base. Indicate which ones you WANT. RATE them 1-10. Check out everyone else's collection. Comment on the records OR just cruise though the site and go back to when you played 45s until you had to put a nickle on top of the arm to get it to play. There is no record too obscure to list. There is everything listed from the 45 that taught your parakeet how to talk to the five solo 45s I have listed by Ronnie Rice (one he even AUTOGRAPHED.) It will even let you know how to identify first pressings, second pressings, and where the records were MANUFACTURED on the many popular songs. Many of course complete with Youtube. The cool thing is that you finally get to SEE the actual 45 you have been lusting for for all these years! I even posted my 45 of "Rosemary" by Brian Hyland that I hunted for for 45 years before I found it for a quarter at a Goodwill store half a mile from my HOUSE! According to the London Standard, Lenny Kravitz is supposed to portray Marvin Gaye in a new bio pic. He's also supposed to sing at halftime of the Patriots / Jets game on Thanksgiving. P.S. Happy Thanksgiving to you, Frannie & The Saxonettes. (I figure if I'm nice to them now, they'll remember me when they're famous!) I like your "White Christmas" idea. Hope they do it. C'mon, kk, who are you kidding? Do you really expect us to believe this is a current photo? C'mon, tell the truth ... this was taken back in the early 80's, right? Today, you're actually bald, or balding ... or gray at best. No way this is a recent photo! 'fess up, your fans wanna know! I just checked ... this photo was taken in November of 2007 ... so five years ago ... when we flew out to the East Coast, met with a bunch of FH Readers and Fans, did the Dave The Rave Radio Show (where we counted down The Top 20 Favorite, Forgotten B-Sides as voted on by our readers ... and had numerous artists call in to talk about their records) and (as this photo indicates) toured the Philadelphia International Recording Studio. It's true, it's true! (From what I understand, Scott Shannon gets this all the time ... 'cause, as we all know, he's just GOTTA be over a hundred years old now, right?!?!?) WRONG!!! This week, we continue myth-busting, showing that people who are looking for particular music attributes listen to the radio longer than those who are not. The truth is that the more passionate a listener is about key attributes that have always defined Radio, the more likely she boasts a long Radio Time Spent Listening. The long-running weekend oldies show, "Mike Baker & the Forgotten 45s," which aired for 17 years on WJJG-AM, but was canceled earlier this year, has a new home. It can be heard monthly on WLTL-FM 88.1, the Lyons Township High School radio station, which was just named as Best Radio Station at the 2012 John Drury High School Radio Awards. The show returned on October 28th, giving the students a chance to learn the production of a syndicated radio show. The show will return once again on Sunday, November 25th from Noon - 4:00 pm. Mike Baker has been a supervisor for the school's highly-regarded radio program since 1993. Happy Thanksgiving to you too, Kent! Thanks for many years of enjoyment! How about featuring the Larry Lujack / Steve Dahl Thanksgiving segment THIS year?? Classic radio. I am thankful on this Thanksgiving that I can listen to all the wonderful songs I grew up with on so many devices anywhere I go ... we are soooo lucky. When you are making suggestions to DJ's about how to re-introduce some of our great 'Forgotten Hits' to a new generation of music fans, although I do not subscribe to Twitter or Facebook, those are the venues to use to monitor the 'Likeability' of songs played ... it's how today's kids share their likes and dislikes. Happy Thanksgiving to you and all the FH subscribers ! My name is Jamey and I'm a volunteer online host of a radio show on KX93.5 in Laguna Beach, CA. It is a low watt community radio station that just started up. I have a one hour show Wednesday nights from 10 to 11 pm. The name of my show is "The B-Side". I have a huge problem in that I have no B-side music. I didn't anticipate not being able to have access to "true" B-side music. The stations library is very limited in that area. VERY!! I'm at a crossroads of maybe having to change my show and format. In my online research I came across you and Dave and your top 200. If you would have any suggestions or could point me in the right direction, I'd be forever grateful. 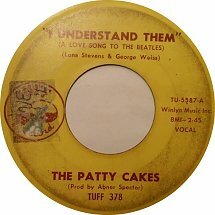 I really love the old tunes and would love to share the history and songs of the old B-sides. Without access to the music, I don't know what to tell you. Our FH Buddy Mr. C does a program out of Nashville called "The Flip Side Show", typically featuring BOTH sides of the records we all bought growing up, often playing records from his own collection. You can certainly use our lists as a guide ... in addition to The Top 200 Favorite, Forgotten B-Sides, we have also built a list of The Top 200 Biggest Two-Sided Hits of All-Time ... between those two lists you should be able to program your program for years to come ... but you gotta have the music, or what's the point? My mentor Chuck Blore, has finally done it ..."Okay, Okay, I wrote the book". The first words of the first chapter ... You can achieve the things you believe. Just keep on believing it’s true and keep on believe in you ... is a theme that permeates the pages of this fun to read and often amazing autobiography. 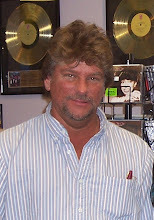 Chuck creates the most successful radio station the nation has ever known and changes the course of modern radio programming. When he leaves to form his own creative services company he astounds the advertising world with creative thinking and innovative imagination. With a little help from several friends from his radio days including Roger Miller, Glen Campbell and Pearl Bailey, Chuck introduces an unheard of freshness to radio advertising and wins almost every major advertising award in his first year of business. It all started because Chuck wanted to talk on the radio. Now, he tells you of his remarkable journey and all of the wonderful, wacky, sometimes inspiring adventures that ‘happened’ along the way. You'd like the Chuck Blore book. In it, he describes the "Ultimate Radio Station" he created briefly in Los Angeles that got great ratings but ran out of money. There's aso the story of his TV spots that were syndicated in Chicago, like the remarkable mouth, the late night janitor and lucious Deborah Shelton. I've been enjoying all the "ranting" about the death of pop radio. I completely agree that so-called programmers and consultants have completely destroyed the listening experience on mainstream radio. But, I need to let you know about a few bright spots on the dial here in the Minneapolis / St. Paul area. WDGY, AM 740, is a dawn to dusk station broadcasting from Hudson / Stillwater (on the Minnesota / Wisconsin border) that reaches into our metro. They carry Scott Shannon's True Oldies Channel, but feature a live local morning drive. They also feature a Saturday morning show called "Hot Rod Radio", featuring lots of car songs from the late 50's and early 60's, and then "Records" Ryan plays two hours of off-beat pop, including much local music from the big Twin Cities garage rock scene in the 60's (Castaways, Underbeats, Trashmen, Gestures, etc.) This is absolutely outstanding radio! WDGY, a big part of 60's radio here, disappeared for decades, and this new AM station reclaimed the call letters ... and all the old station ID jingles! Then, there's KLBB, 1220 AM. They carry the "America's Best Music" feed, but also feature a live local morning show. They, too, broadcast from Hudson / Stillwater. In addition to Frank, Sammy, Dean, Nat, Doris, Peggy Lee, etc, you hear Beatles, adult contemporary from the 50's to the 80's, plus contemporary music from Michael Buble, Norah Jones, etc. A very enjoyable mix when you don't feel like rockin'! The small town local commercials also lend to a very cozy listening experience. Again, they are dawn to dusk. We are EXTREMELY lucky to have these two wonderful AM stations, still delivering great radio. I wish all of your readers could experience this! I've been following your recent exhortations for improved Oldies Radio programming in total intellectual accord, but in abject spiritual resignation -- it ain't never gonna happen! As a long-time producer of syndicated and network programming, I suffered the smarmy fingerprints on my shows thanks to consultants whose memos to the corporate office eviscerated our playlists because they personally didn't like the music or it was rated as unfamiliar in a test offered to an auditorium of 19-year-olds. I frequently caved in just in an attempt to prolong my employment, but on two memorable occasions I responded with a big fat "F*** You." Once was when I was told that the Beatles' "Hello, Goodbye" was a tune-out! The other was when I was producing a country show and was told not to play the Desert Rose Band's "He's Back and I'm Blue" (great record; Chris Hillman of the Byrds, by the way) when it was Number One on Billboard's Country chart. I refused and threatened to quit and the incident blew over. There are some decent consultants by the way. But if radio programmers were competent and doing their job, they wouldn't need to hire someone external to create their own playlists. It really is a case of "The Emperor's New Clothes." "If we're paying the consultant this much money, they must be right." Idiots! Anyway, tirade over. I just wanted to alert you to the fact that your Utopian radio station does exist online. http://www.richbroradio.com/ I just found this a few days ago and I have had it on ever since. This online station is the project of Rich Brother Robbin, a deejay who came to fame at San Diego's KGB in the early '70s. He was a discovery of legendary programmer Bill Drake, but when Drake lost him to competing station KCBQ, Robbin beat them at their own game. I met him once in the '80s. The outfit I worked for hired him to host one of the two or three-hour artist spotlights I'd written. Can't remember what the show was, but I do recall that Rich Bro was a nice guy and very bright, and he nailed most of the script in one or two takes, tops. By the way, I found this site through Claude Hall's blog: http://www.hollywoodhillsgroup.com/claude-hall-profile/. Claude was the Radio Editor at Billboard magazine starting in the mid-'60s 'til around 1980 or so. I suspect that most of the deejays reading Forgotten Hits are already familiar with Claude, but FH readers that have fond memories of favorite jocks of yore are encouraged to check out Claude's blog. His passion for good radio and its best practitioners is clearly very heartfelt and he's a great writer. He's like the department head at the Alumni Office of a great college, keeping old colleagues in touch, and sharing news with the same zeal he did when he actually got paid for it. In just a column or two, you're bound to read something about a jock you listened to over the years. Back to Rich Brother Robbins' station: I'm loathe to mention too many songs I've heard the past three days 'cause I'd like you to be surprised as I have been, but I can assure you that you will be pleasantly surprised. It appears that anything that hit the Billboard Hot 100 is eligible, and I even heard a few "Bubbling Unders" and regional hits. It seems to span approximately 1955 - 1972. The two newest tracks I heard were Stevie Wonders' "Superwoman" and Carole King's "Been to Caanan." Those were exceptions. And while there is a healthy complement of '50s stuff, the real focus seems to be on Lost 45s of the '60s and lesser-played / lower charters from the name acts. Here are just a few examples: Jerry Wallace - "In the Misty Moonlight," Lesley Gore - "I Wish I Were a Boy," Kris Jensen - "Torture," Sonny & Cher - "What Now My Love," The Arbors - "Symphony For Susan," Petula Clark - "Don't Give Up," The Association - "Time For Livin'," Marvin Gaye - "You're a Wonderful One," Chubby Checker & DeeDee Sharp - "Slow Twistin'," Beach Boys - "I Can Hear Music, " The Forum - "The River is Wide," Fifth Dimension - "Save the Country," Stan Getz & Charlie Byrd - "Desifinado," Sweet Inspirations - "Sweet Inspiration," Al Hirt - "Java." The aforementioned examples only hint at the depth and eclectic nature of the playlist. I initially didn't think that there were any repeats whatsoever, but as I type this and continue listening, today's programming has started to be repeated. So it seems that Robbins is probably programming daily eight or 12-hour blocks and running them twice or thrice daily. He occasionally does a station ID, and there are vintage radio jingles and bumpers from legendary stations across the U.S. sprinkled in periodically which add a nice touch of period authenticity. But you must check this out and, perhaps, contact him for more info. This is, far and away, the best Internet Oldies station I have heard. In fact, I've been glued to it since stumbling upon it a little over a week ago. It's exactly what you and all of us readers pine for on Forgotten Hits. The playlist is deep and immense; I'm hearing things that I haven't heard since their original release, and a few that I had never heard before it all. As a result of the email exchanges, I actually ended up having a terrific phone conversation with Rich Robbin earlier in the week. Although neither of us was able to determine what program we had collaborated on 30 years ago, he proved to be the great guy I had recalled from our brief couple of hours in the studio all those years ago. Like FH is for you, RBR.com is simply a labor of love for him, and there is definitely some labor involved in the enterprise. The music stream is not a "random shuffle" affair. If you listen for more than a few minutes, it's very evident that a lot of effort is going into the programming and segues. And the periodic placements of classic jingles from around the country makes it feel period authentic. I know that you'd thoroughly enjoy talking with Rich, as I'm sure he would, you. As we shared our mutual dismay that terrestrial radio just won't give this kind of programming a shot, Rich summed it up succinctly, "Advertisers simply don't care for the demographic that it would attract." Along with the radio megalopolies, Madison Ave. is just another one of those Don Quixote windmills we'd be challenging. Perhaps as the Boomer generation keeps greying there will be some expanded opportunities, but for now, the Internet is probably the best playground we can hope for, and maybe Rich's venture will help inspire others to take a crack at interesting online formats. Just wanted to call this to your attention again 'cause it's so damn good and a nice act of fellowship, like FH and a few select other ventures on the Web. As always, Kent, thanks for championing the cause. Peter Noone just posted on his websites that he is hosting a new program on Sirius XM Sixties at Six beginning this Saturday, November 24th, from 5 pm to 8 pm eastern time. It is called Something Good with Peter Noone and sounds like a retrospective of music and stories from the sixties. Peter has tons of good stories, so I suspect an info-packed program with a few laughs and a great trip down memory lane. Last Saturday night, I went to a casino sports bar to hear some live music. The group was what I call a "generic" cover band. They played almost all danceable songs and were entertaining. They had a big variety of material, from the 50s through the 90s. The disappointing thing I witnessed was that the crowd only got up and danced to a few of the songs in each set, the same few songs that every other band plays around here. All of their covers were very danceable, and nobody cared about most of them, BUT, when songs like "Brick House", "Brown Eyed Girl", and my least favorite cover song of all-time, "Play That Funky Music", were played, EVERYBODY was on the dance floor. What I'm trying to do here is compare this with the state of today's "classic" radio stations, you and the readers have been talking about. Could it be that the general public has been "conditioned" to go with the flow? When it comes to what is aired, has the public taken on a conformist and apathetic attitude? Has a high percentage of listeners forgotten how many hits were out there ... or don't they even care? Have they become selective and reliant on other ways of listening to their favorite songs? Has radio just become background noise? I really do wish there was a "Forgotten Hits" radio network across the country, and the world, for that matter. And Scott Shannon is playing "Forgotten 45's" all weekend long on The True Oldies Channel ... and he's been playing some pretty good ones, too ... stuff you JUST don't hear on the radio anymore ... so tune in when you can! The Seekers is a band that you don't hear much about these days. They really were the first internationally known group to come out of Australia. I absolutely adore Judith Durham, their lead vocalist. What a huge sound from such a pint-sized lady! She still has a powerful voice, today. Take a look at some of her recent videos online. Their hit, "Georgy Girl", and my favorite, "I'll Never Find Another You", can be heard on some radio stations, here and there, but I NEVER hear "A World of Our Own" played anywhere. Up The Ladder To the Roof is far and away better than any Diana & the Supremes single released after Diana had her named tacked in front of the group. To be as ready as possible for Hurricane Sandy, I had three sets of batteries for my radio, just in case we lost power in the storm. I picked a station that was as close to me as possible so that I would be getting valid updates on weather. This station is a 'current pop' station, but used to play 'oldies' as well as sponsor / produce concerts in the area of 50's, 60's and 70's groups. Now they have some djs, some pre-recorded packaged programs, and script material. BUT on Monday, when they lost power, it was those djs - who were not scheduled to come in - who kept the generators going, a variety of songs playing and correct local storm updates that brought us safely through to the flip side of Sandy. Wouldn't it be nice if they could have selected their own music, given us witty / non-sensical / or serious banter without the need of emergency? Oh, I didn't need the batteries ... a block and a half from the beach with no power loss and no flooding. You think it was the radio djs? And you know what, Kent? My day will be better now hearing 'I'm Gonna Make You Mine' and 'Tracy' as I am getting my day together. Day and night are still blending together as, after Hurricane Sandy, power is being restored at various times. We are keeping odd hours in the east. No school yet, but extra hours at Cracker Barrel trying to pull the store into a useful state (without deliveries) for those who are in need. It was great to hear the Vince Guaraldi hit you provided, "Cast Your Fate to the Wind", again! Actually, it's great to hear ANY instrumental hit, these days, right? Did you know that he was not the first one thought of to provide the "Peanuts" cartoon soundtracks? The producers went after Dave Brubeck first. He and his wonderful quartet just had success with their jazz crossover hit, "Take Five", and were about to go on a long tour of Europe. Time in the studio was impossible, and it was Brubeck, who recommended Guaraldi for the job. The producers took his advice, and what a fun project it must have been, to lay down those tracks for the cartoons. I never get tired of any of it. So good to hear "Beg, Borrow and Steal" by the "Ohio Express". For the real story on the making of this great song, check out YouTube. Put in Beg, Borrow and Steal - Original Band Members - Ohio Express. The video clip not only explains the true origin of the recording but proves it with an amazingly accurate performance by two of the original performers. 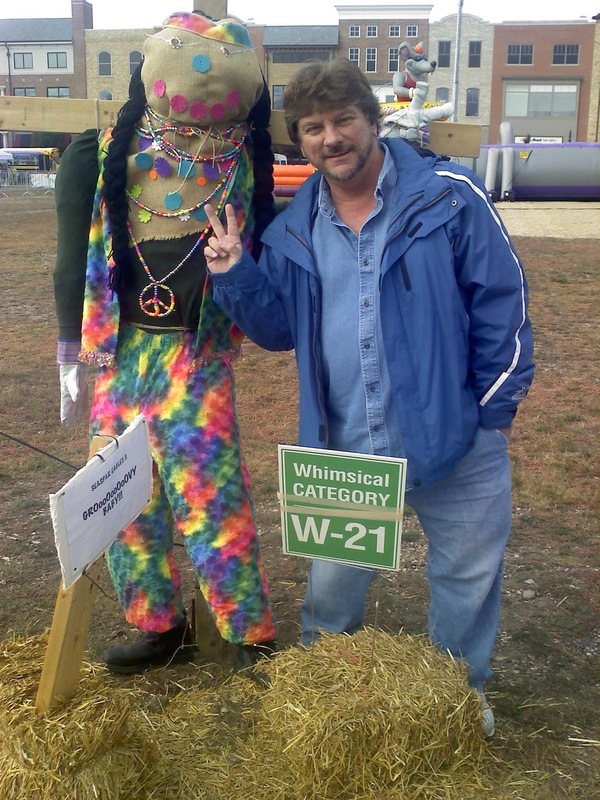 Loyal follower in New Berlin, WI. I remember the musician-songwriter, James Hendricks, very well. I first took notice of his music, when I heard Michael Parks sing "Long Lonesome Highway", as you featured on Tuesday's FH. I loved the TV series, "Then Came Bronson", and was sad that it lasted only one season. One episode I remember was titled, "A Pickin and a Singin". It featured several songs written by Hendricks. It was about a young songwriter, who befriends Bronson, and the two perform the songs at a local pub. Many of them are part of Parks' second LP. Towards the end of the episode, the songwriter leaves the area, because of pressure from a shady dj, trying to secure rights to the songs. Bronson is left to sing at the pub, with an unnamed guitarist, shown in the dark background of the stage. That musician was James Hendricks. I liked the songs so much that I ordered the only available solo LP by him, but was a little disappointed that it was mostly a country album. If you can find the series on video, check out that episode. It was my favorite! 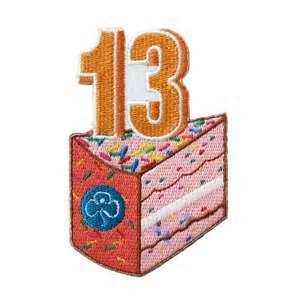 Impressive numbers and body of work these thirteen years. How about new lyrics to the Beach Boys' "Ding Dang" to commemorate the probable passing of the Hostess Ding Dong? I feel the love, Kent! hahahahaha! I remember you in Oldies Chat on AOL. You should compile a list of people still visiting your FH web site who 1st met you there. It'd be interesting to see how many of those s/n's we remember :) FYI: Oldies Chat room's pretty much just a memory now. Hardly anyone goes there anymore. I last visited it a year ago, saw someone's s/n I recognized, and asked them about others who used to frequent that room I was shocked to discover that half of them had died! So sad ... Oh well,keep on keeping on kk ... and don't forget to boogie. You have been a valuable resource for those of us still trying to fight the good fight to keep radio interesting. Count me in for the Garage Band Countdown. 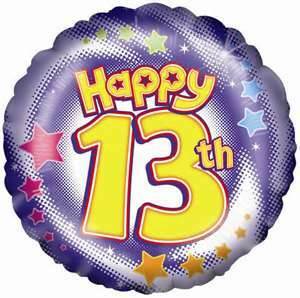 Congratulations on reaching the 13th anniversary of "Forgotten Hits." You certainly picked some fine songs that first time out. I agree that Tommy James' "Mirage" is a much-underrated, much overlooked song. Excellent choice. I hope you have a happy Thanksgiving, and keep producing "Forgotten Hits" for many more years. Thanks for all the work you put into your website. It is not to be missed, I am sorry I missed the first 10 years!! 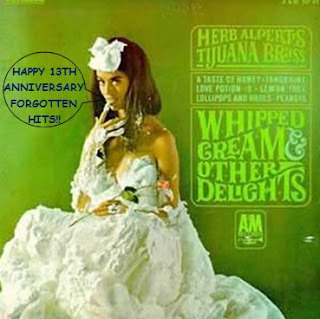 Happy Anniversary to you and Forgotten Hits ... It's something I look forward to every week!!!!! As I told you before, I'm an old radio jock, retired, but I never cease to learn something new from FH. Your hard work and knowledge of how this crazy music biz works is incredible!!!!!! I hope, God willing, that we have MANY more FH anniversaries ahead! Congrats, and may you and the family have a safe, healthy, Blessed, and Happy Thanksgiving!!!!!!!!! Congratulations on your anniversary! It is especially sweet since I was with you in the beginning. 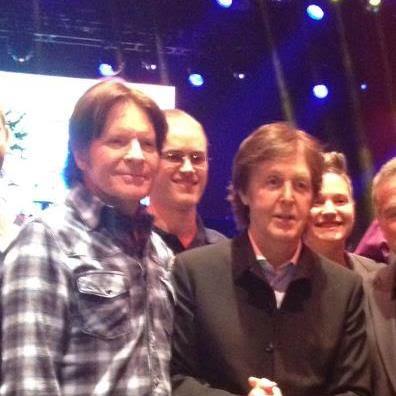 You deserve induction into the Rock and Roll Hall of Fame. We just have to figure out which category you should be nominated in! MAY THE 4's BE WITH YOU!! !